Claudia Paul Award for ‘Determination’ was presented to Charlotte Seager. Tracey Perks Award for ‘the rider who consistently tries hard’ was presented to Archie Parsons and the Neil Hancock Award for the ‘one who has made good progress’ was presented to Billy Humpheys with a special rosette awarded to Kathryn Burnett. The Pauline Richards Award for ‘the rider who can meet the challenge’ was presented to Arthur DugganMichael Jack Award for Show Jumping was jointly presented to Anna Harper & Fi Martin, The Claudia Paul Award for being a ‘daredevil’ was presented to Leo Burbidge. Countryside Challenge Award for the highest mark overall at the Qualifiers or Fun Day was presented to Sasha Simmonett. South Award for the ‘Most Improved adult rider’ was presented to Lisa McLaughlin. The Liz Jackson award presented by Simon Jackson for the Most Improved Child Rider was presented to Leah Oldrey and the Horse Care & Knowledge award was presented to Isabella Benfield. 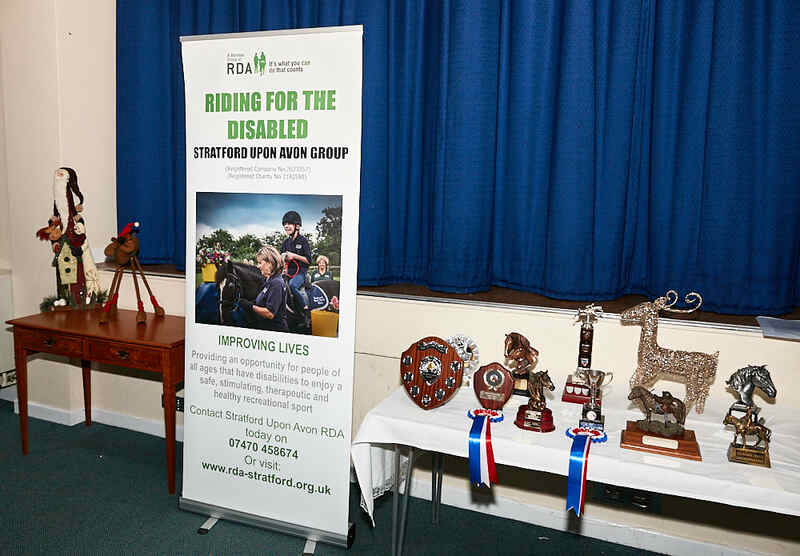 The Stratford RDA Achievement Award went to Lewis Tandy for his great results at the RDA National Championships. The Boris award was presented to a surprized Donna Jenkins for the volunteer who is ‘always being willing’ and the RDA West Mercia Volunteer of the Year award was presented to Isobel Ollis for her commitment and support to our Group, and the dedication in delivering our Regional Qualifier and County Fun Day. It is so lovely to bring everyone together for this happy event each year, but even more so at the end of our 50th anniversary year. Congratulations to all our riders for their achievements and a big thank you to all our volunteers, sponsors and supporters, who have helped to ensure that the Group continues to grow. Next post: Well Done Sophie!